Take this roomy tote from the market to the beach and back! Fun accents show off your favorite prints. Exterior zipper pocket. Exterior slip pocket option. Key loop. Note: This class was originally listed in the newsletter as the "Seashore Tote" and has been replaced with the Poolside Tote. Requirements: Sewing Machine with walking foot and basic quilting supplies. The fully lined, pull-on Bubbles skirt is easy to make and fun to wear. Great for everyday wear in light to medium weight cottons. The Button's skirt buttons down the front or can be made as a pull-on skirt with the buttons for decoration. The two, playful pockets can have an optional coordinating fabric for the flap. Both have elastic in the back of the waistband for an easy fit. Children Sizes: 1-8. We will be making the pull-on (elastic waist) option. Tracey will guide you in creating this summer must-have! With its nipped-in empire waist and a breezy flowing skirt that falls smoothly over the hips, the Summer Jazz Dress drapes beautifully and flatters every figure. Made as a top, a dress or a maxi, with optional inseam pockets to carry all your essentials, it's the perfect pattern for all the occasions in your life. Sizes 2 through 20. Requirements: Sewing machine in good working order, Summer Jazz Dress pattern, fabric, and basic sewing supplies. Contact store for supply list. Beginning Quilting - 6 week Evening Class! 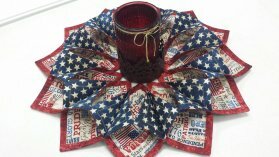 We will be doing the Rail Fence pattern from "Start Quilting" with Alex Anderson. Learn to choose fabrics for your quilts, cut fabric properly, sew blocks together, lay out a quilt, sew on a border, quilt the quilt, and finish with binding. In six weeks, you will have a finished quilt! 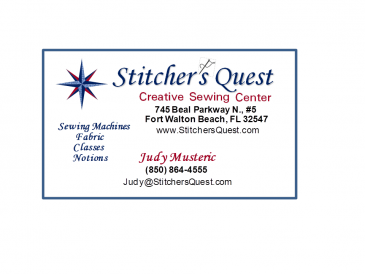 Stitcher’s Quest gives 10% discount for student purchased supplies. Fabrics will be chosen on first day of class. Requirements: Sewing machine in good working order with a walking foot, book, fabric, and basic quilting tools. Contact store for supply list. We still have space in our Summer Youth Program - call for details!